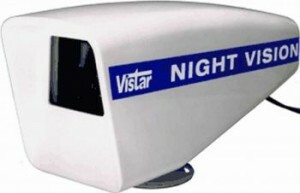 The Vistar 172 was designed as a lower cost device to aid navigation of large yachts, work boats, in fact anyone who may wish to navigate safely at night. The 172 was not designed to meet either the IMO or the Hong Kong specifications but is intended for use where IMO Regulations are not mandatory. The system is designed to aid the helmsman in navigating in congested waters or moorings. The 172 can be invaluable in detecting objects in the water ahead of the craft such as debris, unlit craft or swimmers.